🙂 Most apples have been eaten at this stage in an apples life…but someone in my house only ate half and the combination of heat and humidity the past days was apparently optimal for preserving apples. Thank you for responding, Reggie. what en excellent juxtaposition of textures and shapes! The skin of the apple around the edge makes a great “frame” and keeping the photo up close and tightly shot means you make the most of highlighting the detail. I did buy a macro lens with my new camera but haven’t had time to get to know it at all yet. (I know…very bad). Thank you for your detailed comment, Kiwidutch. I am using a Panasonic Lumix LX3, which can go as close as 1 cm. It is not a SLR, but offer many of the same functions – except changing of lenses. I use to enlarge and crop my photos, so all in all I can come close to the objects as long as the photo is clear. If I had a macro lense like you have, I would just put it on, and see what would happen. Macro is fun. A person can have a lot of fun playing with your images. They are rich with possibilities. I can see a fossil, a bit of piecrust, the snout of a particularly fierce lizard, the skeleton of a flying squirrel . . . OK, it’s winter, I get like this. 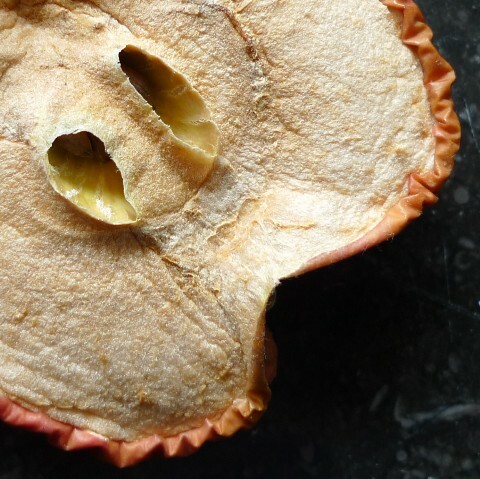 Have you ever seen dried apple dolls? Gerry, I can follow you, except for the skeleton of a flying squirrel, a picture I find absolutely creative, though the imagination of my personal tree-spoiling squirrel as a flying skeleton makes me a bit nervous. I wouldn´t be surprised if it came flying one day. My greek friend has named it HERMES, inspired by the postman for the Greek gods, because it is so busy running around here and there. I get the feeling that wintertime is perfect for you to write novels of high creative quality, – perhaps you have already started? Your imagination is perfect for a complicated mysterious and creative history. I would love to read it! Dried apple dolls?, no, never. But I would surely like to know more. Here is a link to the kind I was thinking of, the folk art dolls that were common in my childhood. When I was looking for that, I found all sorts of other things that will be food for thought. Astonishing. An apple doll? I just looked at the link and my eyes almost fell out of head LOL, How amazing a thing is THAT? Thank you Gerry, this was completely new to me. Very interesting to see how they are made, and to learn about how people always find a way to make things of importance, (in this case toy) despite lack of materials. I have to try to make one! Gerry, it’s been over 30 years since I’ve seen a dried apple doll. They were quite the rage back then. Giid, those two holes look like nostrils. It looks like the apple has breathed its last. You captured it just in time. What an interesting image! NOT what I expected either, Great textures! Hi Michaela. I find the textures interesting too, the white (apple-meat in Danish) is slowly changing into a soft silk or cotton look. Very interesting to follow. I absolutely love this shot! Funny image. Kind of like an old man? I keep looking at the sheer beauty of this picture… its dented edges on the black background, the open cavities where the seeds used to be, the amazing textures you captured, all so beautiful ! I too think so, it is fascinating in some way. It doesn´t look old and dry as expected, but has almost a personality!